There are two types of credit card cash advances. The first and more common type occurs when you treat your credit card like a debit card, using it to withdraw cash from an ATM. This form of cash advance is subject to a cash credit limit, which typically comprises only a fraction of your total credit line. Both your cash credit limit and the PIN needed to make a cash advance can be found by calling your bank. The second type of cash advance also allows you to tap into your credit line, but instead of withdrawing cash, your credit card is used to write checks or transfer money into a bank account. With this type of cash advance, you may or may not be subject to a lower cash credit limit, depending on the issuer. As you’ll see below, both types of cash advances come at a steep cost, as making these types of transactions triggers the immediate assessment of a costly fee and a high interest rate. Out of all the credit card fees, the ones associated with cash advances are some of the most exorbitant – and this applies to both types. 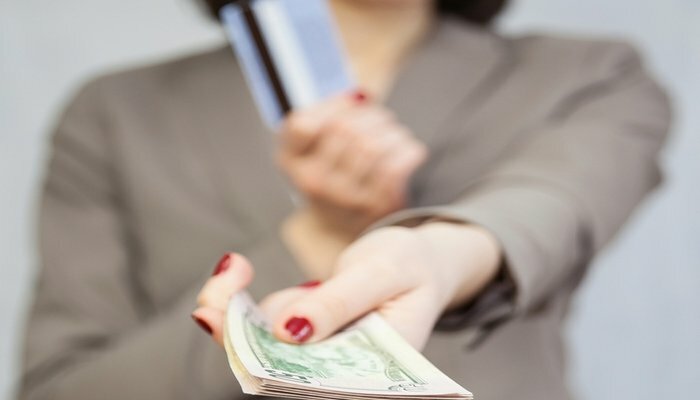 Many individuals are fooled by their convenient façade but end up paying the price – quite literally – when their credit card bill arrives a few weeks later with an additional $10 to $50 tacked on in fees. The first method is a flat rate fee that will be assessed irrespective of how much money you withdraw. For many banks, this charge tends to hover around $10. Therefore, if you withdraw $250, you will have to pay $260. The second method is to charge a percentage of the money you withdraw – usually between 2%-5% – as a fee. In this scenario, if you withdraw $250, your fee could reach as high as $12.50. The third method, which is the most common, is a combination of the first two. Many issuers charge either a minimum flat rate or a percentage of the amount withdrawn – whichever is higher. Let’s say the fee percentage was 5% and the minimum rate was $10. If you withdrew $50, you wouldn’t pay a percentage fee of $2.50 – you would pay $10. Cash advance fees have been rising steadily over the last few years. According to WalletHub’s latest Credit Card Landscape Report, the average cash advance fee is now the maximum of 3.9% or $12.41. It is also important to note that doing a cash advance at an ATM will likely result in you being assessed an ATM owner surcharge in addition to the cash advance fee and high interest rates charged by your credit card. These fees range between $2-$5, and though they are the lowest of the ones we’ve discussed, they can still add up. If the costly cash advance fee wasn’t enough of a drawback, it turns out things get even more … expensive. From the moment you withdraw money – whether in cash from an ATM, through a check, or by transferring money to a deposit account – your credit card company will immediately begin assessing interest. That’s because, unlike the rest of the purchases you make on your credit card, cash advances typically lack a ‘grace-period’ for accruing interest. What’s more, the APR for cash advances is almost always higher than the APR for regular credit card purchases. Cash advance rates tend to hover between 20% and 36% – the average is currently 22.7% – while regular rates are typically in the 14%-23% range. They are very costly, ultimately causing you to pay much more money (through fees and interest rates) than you initially withdraw. Doing a cash advance because you are short on money can create a vicious cycle of borrowing for immediate needs that ultimately spirals down to payday loans and other decidedly unfavorable borrowing mechanisms. They do not look good in the eyes of your creditor. Taking out a cash advance signifies financial desperation and hazard – the deadly combination of a high-risk customer. As a result, we recommend taking measures to ensure that you will never need to make a cash advance. We’ll give you some tips for doing so in the section below. Exhaust Other Options First: Is there a way you can use your credit card instead? An over-the-top interest rate and fee can be avoided if you make the purchase directly through your credit card. Create a Budget: Personal budgeting is one of the most integral parts of financial management. So keep track of your income and expenses so you can gauge your progress. Furthermore, cut down on unnecessary purchases and devote your saved money to establishing an emergency fund. Consequently, if you ever need a cash advance, you can just turn to your emergency fund instead. Open a Cash Account: Having either a checking account or a prepaid card that gives you access to free withdrawals at a large ATM network is one of the best ways to avoid cash advances. Making sure you always have some money in your account will enable you to access cash in emergency situations without incurring unnecessary expenses. Cut Your Losses: One of the most frequent places in which cash advances are made is the casino. Casinos boast a plethora of ATMs, after all, in addition to far too many people who are laying their last buck on the line and looking for more if they bust out. The best advice in such a situation is obviously to resist the cash advance and call the session quits. You don’t need to make it back the same way, and perhaps today is just not your day. Just Wait: Cash advances should only be used for emergency purposes due to their costly nature and their negative impact on your credit reputation. If your purchase is not for an emergency, your best alternative is simply to wait until you can acquire cash through some other means. In fact, most emergencies – especially those that are health oriented – are payable via credit cards, so if you’re finding yourself in a situation where you need cash immediately, pause to assess whether it is truly obligatory or not. Avoid Issuer Overtures: Credit card companies will often mail checks to customers who have not used their cards in a while as a means of spurring renewed account activity. Before using these checks make sure you’re clear about the fees and interest that comes with them because they are considered to be cash advances in a lot of cases. How do I get a cash advance that's transferred into another account?